2012 – Tulis School Celebrates 20 Years! 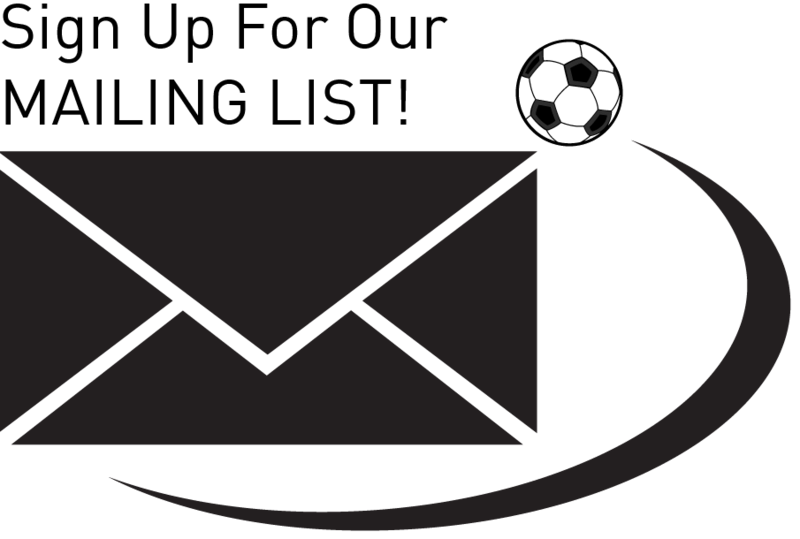 While every season at Roman Tulis is special, this one happens to be exceedingly so – September 4th, 2012 marked the start of our 20th year as a soccer school! Over the last 20 years our players have accepted Roman’s challenge to be the best they could be, and as a result have achieved some amazing things; it is up to the young players who start their training at our field this season to continue pushing themselves so that Roman’s soccer dream can live on. 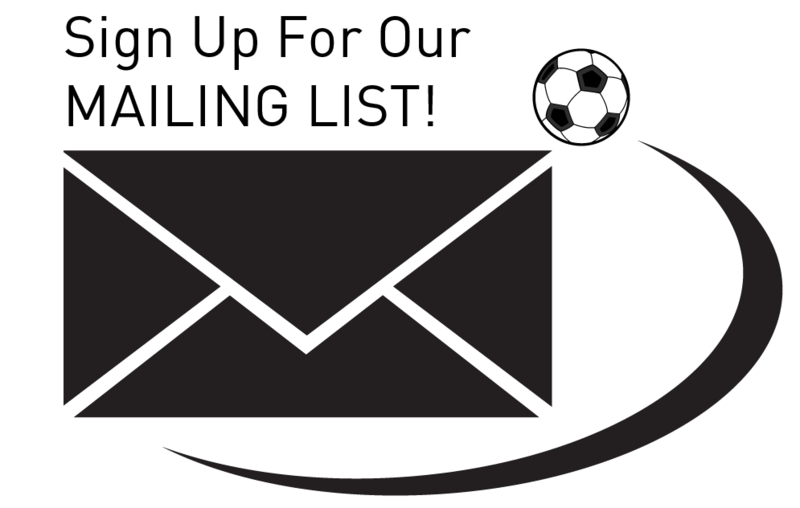 We would like to say a big thank you to everyone who has been a part of this amazing process over the last two decades and look forward to offering many more years of excellence to Vancouver’s brightest young soccer stars. Roman Tulis School’s home field at Burnaby’s premier sports centre (the Multisport Centre of Excellence) is undergoing a name change. The centre will officially open in the spring of 2013 as the Fortius Athlete Development Centre. 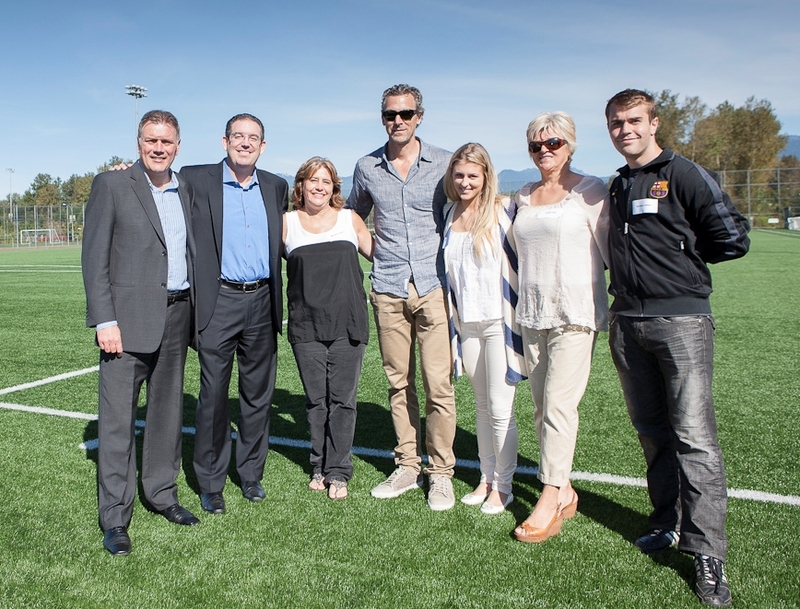 Pictured on the Tulis home field; (left to right) Bob Lenarduzzi, Scott Cousens, Maryann Lennox, Trevor Linden, Nicole Tulis, Danka Tulis and Caedyn Lennox attend a news conference on the site of the nearly completed $61 million athlete development center in Burnaby on Sept 12th, 2012. 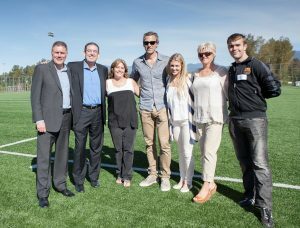 Scott Cousens, former Tulis parent and chair of Fortius Sport and Health, has given the gift of sport in the form of a $23-million donation in order to complete construction on the Fortius Athlete Development Centre. The centre will house everything from athlete accommodation to sports-medicine facilities, as well as being home to the new Tulis dressing room, lounge, and office. 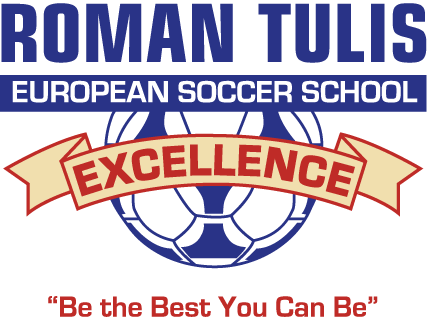 On behalf of athletes everywhere, the Roman Tulis European Soccer School of Excellence would like to offer our most sincere thanks to Scott and his team. U-12 Boys ~ ”CUP NO.1” CHAMPIONS! July – 2012 – In what was a tightly contested, high scoring match, the Roman Tulis European Soccer School of Excellence’s U-12 boys emerged victorious at the 2012 “Cup No. 1” tournament in Denmark. 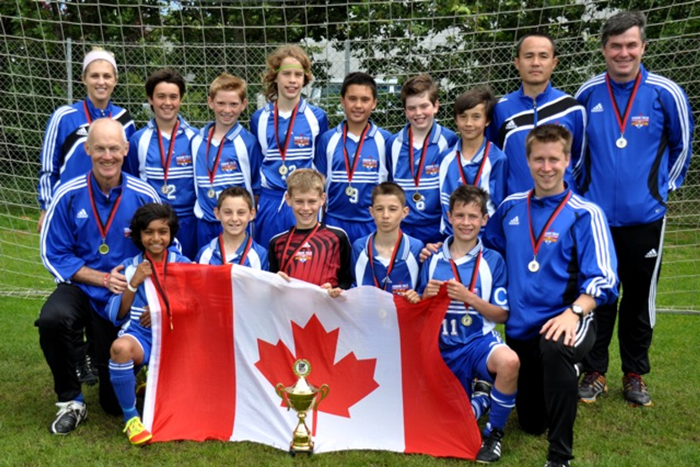 The Tulis U-12 boys would be the only team carrying the hallowed Maple Leaf in the opening ceremony parade of the “Cup No. 1” tournament in Frederikshavn, Denmark. Sandwiched between teams from Brazil and Colombia (teams were ordered alphabetically), the U-12’s did their nation proud. Between some cheeky European chants and the national anthem, they made sure that everyone knew who we were. Heading to bed that evening, I think many of the boys grasped for the first time what an amazing opportunity they had in front of them. The next morning the jet lagged Tulis boys opened the tournament against a team from Strandby, Denmark. After going down a goal early in a nervy start vs. this Danish team, the boys recovered to open their campaign with a 3-1 win. The following day the Tulis team breezed past local side Bangsbo Freja 5-0 and that afternoon they secured their spot atop the group with an emphatic 8-0 victory over Uraedd FK of Norway. Then building on the momentum, they took Scandinavia by storm in their final group stage games. The U12 Tulis team was now into the semi-finals. Set to face a perennially strong Bremerhaven side. The boys needed to draw upon their many years of Tulis training to progress to the finals. In a tightly contested match that saw chances for both teams, the Canadian boys managed to slot home 10 minutes from time, providing what turned out to be the winning goal. Now just 50 minutes away from writing their names in the record books, the boys were doing everything they could to prepare themselves for a tough clash against hometown favourites, Frederikshavn FI. The morning of the final match was a morning that every young soccer player dreams about – after a week of hard work and concentration, the Tulis boys had set themselves up for the chance to play for gold in a bona fide European final. Word of the classy Canadians had spread over the course of the week. For spells of the final match of the tournament it looked as though a Roman Tulis win was all but assured, but some creative attacking from the relentless Danish side kept everyone wondering until the final whistle blew. In the highest scoring match of their campaign so far, the Tulis boys worked until the end to produce a magnificent 6-3 display which secured not only the trophy, but the respect of everyone at the tournament who saw a team from Canada play like they belonged with Europe’s elite. When we think of famous soccer players, names like Lionel Messi and Cristiano Ronaldo instantly come to mind. Or if we want to look a little bit closer to home, some of our more celebrated alumni like Terry Dunfield and Niall Cousens might be the stars you look up to. But lost among the noise are those just starting their soccer journey and trying to make a name for themselves in a perennially cutthroat environment. It’s become almost cliché to say that youth soccer in Canada is on the brink of something special, but with this latest crop of youngsters we may finally see the promise fulfilled. Spearheading the next generation are a fair few “junior alumni” from our school – players who have moved on at an early age to join the academies of professional soccer clubs. A few years ago, Gianni Patino left our school to join the famed Barcelona youth academy. Since then, we’ve had several players follow suit by way of being invited to join the Whitecaps’ new “Residency” and “Pre-Residency” programs. 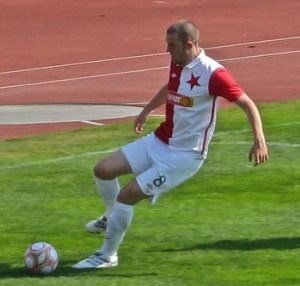 The latest Tulis players to join are Jonas Hakkinen, Matthew Miki, Patrick Ainge, Miles Gailiunas, Alessandro Hojabrpour, Evan Ince, Eryk Kobza, Niko Papakyriakopolous, and Tristan Torresan. Of those mentioned, two joined us on this summer’s highly successful European tour as team captain Patrick Ainge and goalkeeper Evan Ince brought home gold from the Dana Cup No.1 in Denmark and finished ahead of 107 teams from around the world in Sweden’s Gothia Cup. 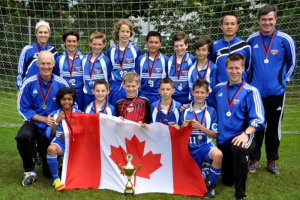 Equally impressive were the exploits of Miles, Alessandro, Tristan, and Niko, who were selected to represent Western Canada in the 2012 edition of the Danone Nations Cup. Unfortunately, the Western Canadian team lost their playoff match against Eastern Canada, thus failing to advance to the showcase tournament in Poland; however, Tristan’s inspired performance in that deciding match earned him an invite to join the Eastern team on their trip. Tristan was also involved in the BC Summer Games along with fellow Tulis players Jonathan Unger and Ross Henderson where the trio finished second to a strong team including another Tulis player, Niko Papakyriakopolous. It is important for young players reading this to note that most of the players we’ve mentioned are only 12 years old – and that what they have already achieved is in the immediate future for many of you if you’re willing to put in the work. But success in the long term – for these players or anyone else – is by no means guaranteed. The only way to give rising stars a chance to shine on the world’s biggest stages is to make a long term commitment to Roman’s philosophy: “Be The Best You Can Be”. Marcus Haber Marcus enjoyed a solid second half of the season with St. Johnstone of the Scottish Premier League. Holding his own in one of the world’s elite leagues, the Tulis graduate played a large part in his club’s respectable finish as he guided them to a coveted Europa League spot. While he didn’t manage to hit the goal streak that has so far followed him throughout his blossoming career, his work off the ball created opportunities for his teammates and gave opposing defenders the most unpleasant of dreams. So great was his play that it earned him a contract with English League 1 side Stevenage FC where he has contributed with a plethora of goals and assists over the first half of the current season. Haber also played a key part in Canada’s attempt to qualify for the Olympics, and although the team fell just short, Marcus can be proud to have scored his 5th goal for the maple leaf against the powerhouse Mexicans in their final match. Terry Dunfield To say that the first half of 2012 has been tough for Dunfield and his Toronto teammates would be putting it lightly; and the pressure now mounted on Canada’s first MLS franchise is anything but. After a dreadful start to the season in which Dunfield was one of the rare glimmers of hope for the squad, TFC look to be mounting an effort to prove to the rest of the league that they are a much stronger side than their record suggests. Now under the direction of a new coach, Terry says that he’s “…excited…” about their prospects and will look at the new season as an opportunity to kick-start Canada’s first MLS franchise. Paige Adams A lot has happened to the four-time School Girl since the university school-year ended just a few short months ago. After returning to full fitness with the University of Wisconsin Badgers, Paige has decided to return to the city where it all began as she became a marquee signing for a new-look Women’s Whitecaps. Unfortunately the Whitecaps have chosen not to field a team in this upcoming season, so after Paige’s brief stint back in Vancouver, she’s crossed the border once more to finish her undergraduate career with the Badgers. This past fall, she led the team in a big way with 6 goals and 5 assists to her name, as well as a spot on the prestigious Academic All-Big Ten team for the third year in a row. Kevin Harmse Kevin’s rough, no-holds-barred style of play has earned him quite a few unsavoury nicknames from opposition fans; this year, however, he’s earned himself a new nickname: “Captain Fantastic”. Drawing on years of MLS and international experience, Harmse has led the way for the San Antonio Scorpions as the franchise’s first ever captain. As the NASL starts to heat up (literally and figuratively) in the coming months, he will look to continue inspiring his troops in the hopes of repeating last season’s successful campaign. After finishing first in the league and narrowly missing out on playoff glory, Kevin and the Scorpions will move into a brand new, soccer specific stadium in April that is fitting of the exciting brand of soccer they play. Kaila Henley A new addition to the Tulis coaching staff, the two-time School Girl has just signed for SFU after a standout year featuring for Langara’s women’s team. Having earned a reputation as a tough defender with good ball control, Kaila will most certainly play a big role for the Clan as they venture into the perennially competitive NCAA. Lucas Menz After a highly successful career in Vancouver with Quest University and the Vancouver Whitecaps Reserves, Tulis alumnus Lucas Menz has now broken into the highly competitive European soccer scene with Ebbsfleet United of the Conference National in England. Unique among soccer clubs in the UK, Ebbsfleet United is owned and operated by its supporters through an online community called “MyFootballClub”. This means that the 6’2” goalkeeper had the support of over a thousand fans before he even pulled on his gloves for the club. And after putting in some strong performances when called upon, it is only a matter of time before he makes yet another leap in his budding professional career. Mike Belle The ball might not be the same, but his commitment to excellence is as strong as ever; Tulis alumnus Mike Belle has traded field for fairway as he shines for Simon Fraser University’s golf team. The same leadership qualities that made Mike a great soccer player have earned him the privilege of captaining the team. The long-time Tulis player has impressed since first appearing for SFU in NCAA golf: Among his many accolades are countless GNAC Golfer of the Week honours, a top 10 finish in the GNAC Conference Championships, and a second place finish at the University of Victoria Shootout. “Be The Best You Can Be” – there is no doubt that Roman’s time-honored philosophy has produced many world class soccer players over the past 20 years. However, rarely applauded are those who have used this philosophy to find success off the pitch. Roman advocated for his players to succeed in all areas of life, believing that excellence in sport meant nothing unless it was accompanied by an excellent attitude. Although Kim Cheema and Roman Tulis Jr. were great athletes, the attitudes they developed in Roman’s school led them on an entirely different path than the typical Tulis star. Or should I say Dr. Cheema and Dr. Tulis? Roman Tulis Jr., 2001 School Boy and lifetime member of the Tulis clan, completed his undergraduate degree at the University of Illinois in Chicago, earning many accolades in the process. He then continued his education at the University of Alberta Medical School in Edmonton and completed his medical degree earlier this year. At this time, Dr. Tulis spends most of his time in hospitals in the Edmonton area as part of his two year residency program in Family Medicine. Despite his hectic schedule, he never misses an opportunity to jet back to Vancouver to watch over his Dad’s school, electing to forego sleep for the chance to help the next generation of players “Be The Best [They] Can Be”. Amid the hype of professional soccer, it can be easy to overlook university sports. However, for many Tulis alumni, varsity athletics offer the perfect blend of intense competition and education. Last month, UBC won the CIS men’s soccer championship on the back of an undefeated season. Leading the way for the Thunderbirds were four Tulis alumni: Paul Clerc, long-time Tulis player; Kent O’Connor, 2004 School Boy and Hall of Fame inductee; Brandon Bonafacio, long-time Tulis player; and Sean Haley, 2008 School Boy. SFU made history recently by being the first Canadian school to compete in the prestigious NCAA national championships. Not content with merely competing, however, the Clan fought their way to the final four of the American tournament, knocking off several big-name teams in the process. This playoff success came on the back of an impressive 19 win regular season, led by 2007 School Boy and current Tulis coach, Jovan Blagojevic.